Supported by Exe Sails, E Howard-Davies Memorial Fund and South Staffordshire Sailing Club. The Association’s first initiative to inspire ladies who sail, took place on Saturday 30th July 2016, jointly with South Staffordshire Sailing Club (SSSC). This was a very successful coaching event. Adam Savage, who has 25+ years experience of dinghy sailing, led the coaching session. He skilfully pitched the coaching session to match the needs of the very diverse spread of abilities. Visitors came from both the Midlands and the North, with all five boats getting time out on the water; practising spinnaker flying, starts and boat handling. SSSC provided evening entertainment and invited the visitors to join club racing on Sunday. “The session was personalized and focused with some really good new exercises. I think everyone got something out of the day.” Meg and Hayley, youth fleet sailors regularly competing at GP14 championships. “We learnt so much today. We had never flown a spinnaker before. Such a rewarding day!” Rosemary and Anna, both returning to sailing this season. “It’s great when you get one of those ‘light bulb’ moments and it suddenly clicks. 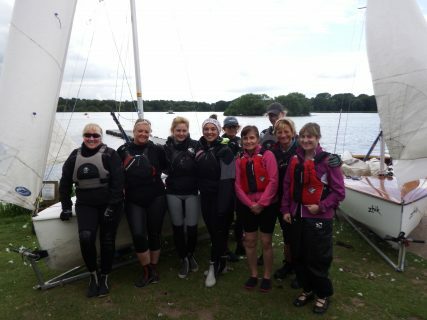 Great coach, brilliant day, please can we have some more?” Lisa, a crew regularly competing at GP14 championships. If you would be interested in taking part in a Ladies that Launch 2017 event, please contact Ann Penny (President).